We read a story of a rich young man who asks Jesus how to obtain eternal life. Jesus replies, keep the commandments. The young man says he observes all the commandments. Jesus tells him to go sell all he has and to come follow him. When the young man hears this he goes away sad. He had many things. Jesus’ disciples observing the scene where dejected themselves because if a rich man can’t obtain eternal life they felt they had no hope. 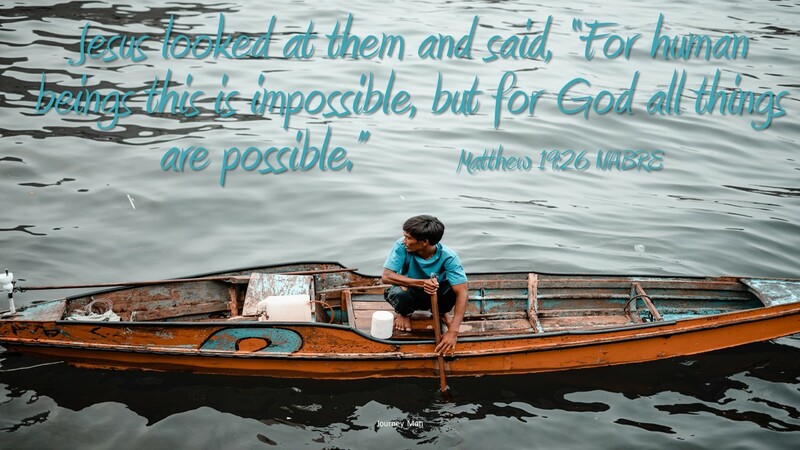 They ask Jesus who can be saved and Jesus responds with the quoted verse, a famous message that all things are possible for God. It is not a story that is against riches, but placing a priority on riches over the message of the gospel is not going to lead to eternal life. Many rich people will get eternal life because they have more confidence in God then their riches. The disciples will obtain eternal life as well because they put their confidence in God. Salvation comes from God, and I am sure we will be surprised by those who receive God’s grace and obtain eternal life. We need God to be led to eternal life because human nature lacks what is needed to attain such a supernatural goal. However, helped by God, eternal life is available to all. It does not take special intelligence, special skills, hard work, or even the best prayers to achieve eternal life. We really must depend on God. From our point of view we must first believe in God and have faith and confidence in His mercy. We demonstrate our faith by doing the will of God; therefore it might seem like work gets us there, but it is our faith and belief that God uses to guide us to not only eternal life, but to our best life here. Do you believe in God? If so how do you show it? If not, let’s talk.